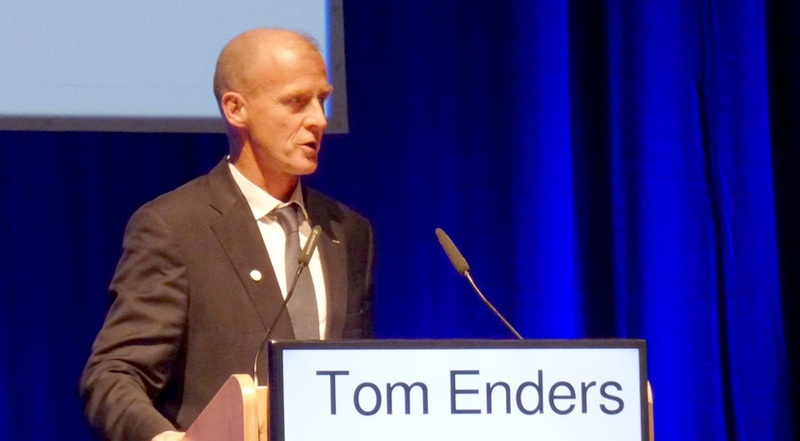 BREMEN, Germany — The chief executive of Airbus used an international space conference to call for reforms in how Europe manages and funds space activities in order to better compete on the global market. He contrasted the status of space in Europe with the United States, crediting both government policies and businesses approaches there. “Our American friends have succeeded because they are proactive in embracing and leveraging the disruptive change in space,” he said. That includes startups willing to “fail fast,” an approach he called “anathema” to larger companies, particularly in Europe. He also noted government support, including government agencies purchasing launches. “Washington guarantees a minimum capacity utilization for launches, particularly for SpaceX,” he said, also noting support for NASA’s commercial crew program and its proposed lunar Gateway. He didn’t discuss what that restructured space governance would look like, but one attribute, he said, should be with eliminating the use in many cases of “georeturn,” a process used in ESA programs where countries receive contracts on the basis of how much they contribute. “Has anybody ever heard that the U.S. launched a sensitive payload, a sensitive satellite, on an Ariane rocket?” he said. A longstanding provision of U.S. national space transportation policy is that U.S. government payloads should launch on U.S. launch vehicles, although with rare exceptions like the future launch of NASA’s James Webb Space Telescope on Europe’s Ariane 5. Although Enders talked about the importance of working on innovative projects, he offered few details on how to create a commercial space startup culture like the one in the United States. During a question-and-answer session that followed, one person noted that American companies benefit from backing by billionaire founders. “What is wrong with the European billionaires?” he asked.